Royal Caribbean International invites guests to come seek adventure in the Caribbean in 2017 and 2018. With seven of the 23 ships in the fleet offering a diverse collection of year-round short and long itineraries to 20 of the Caribbean’s most popular island destinations, there’s a cruise to fit every guest’s holiday style. Voted best cruise line in the Caribbean for 13 years running, Royal Caribbean’s 2017/2018 year-round sailings are now open for booking. Harmony of the Seas, the first in a new generation of Oasis class ships where ground-breaking architectural innovations are combined with breakthrough technologies of the Quantum class, will sail its first summer season to the Caribbean. 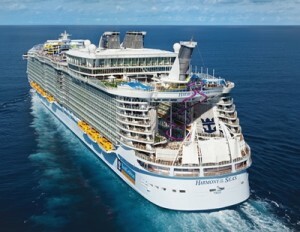 In 2017, Florida will be home to three largest cruise ships in the world year-round ̶ Harmony and Allure of the Seas in Ft. Lauderdale, and Oasis of the Seas in Port Canaveral ̶ providing guests with even more convenient access to the distinctive cultures and landscapes of the Eastern and Western Caribbean. Recently repositioned to Central Florida from Port Everglades Cruise Port and offering easy access from Greater Orlando, Oasis of the Seas will sail a new seven-night Eastern Caribbean itinerary in 2017 that calls on Nassau, The Bahamas. Travellers with a passion for adventure can take advantage of recently-launched Caribbean shore excursions, including jeep tours to hidden Mayan ruins in Cozumel, Mexico; flyboarding in St. Thomas, U.S. Virgin Islands; and a new Royal Extreme Challenge ropes course in Falmouth, Jamaica. Following multimillion dollar revitalizations in 2016, Adventure of the Seas will sail from Puerto Rico to the most sought-after Southern Caribbean islands on seven-night itineraries, and Liberty of the Seas ̶ Galveston, Texas’ biggest, most adventure-packed ship ever ̶ will remain in the Lone Star state in 2017, offering a variety of seven-night escapes to the Western Caribbean. Belize City, Belize – Guests can embark on Liberty of the Seas and go from Galveston, Texas to hiking in the rainforest, cave-and-river tubing, bird watching and exploring Mayan ruins. From the top of El Castillo, one of the tallest Mayan structures in Belize at 130 feet, travelers will be in awe of the expansive vista of the lush rainforest of Peten, Mayan Mountains and even see across the border into Guatemala. CocoCay, Bahamas – Reserved exclusively for Royal Caribbean guests, this 140-acre tropical paradise was awarded a Gold-Level Eco-Certification by Sustainable Travel International for its environmentally friendly activities and nature tours. The destination is featured on many of the fleet’s Caribbean itineraries, including recently revitalized Majesty of the Seas sailing from sailing from Port Canaveral and Enchantment from the Seassailing from Port of Miami. San Juan, Puerto Rico – A home port for Adventure of the Seas and Jewel of the Seas, and a port of call for ships like Harmony of the Seas, guests can enjoy the opportunity to witness the pinnacle of natural beauty by exploring the El Yunque Rain Forest, featuring more than 240 species of trees and what was once believed to be the Fountain of Youth. St. George’s, Grenada – This unique island offers lush vegetation, mountainous terrain, colourful colonial architecture and one of the most picturesque ports in the Caribbean. Globe trotters can choose a guided tour of one of the local rum distilleries or spice estates and try a traditional Grenadian dish, such as callaloo soup, whether sailing from Florida or Puerto Rico.